The Schomburgk Pavilion celebrated the Adelaide Botanic Gardens 150th birthday. It was concerned with the relationships between the environment, culture and society. 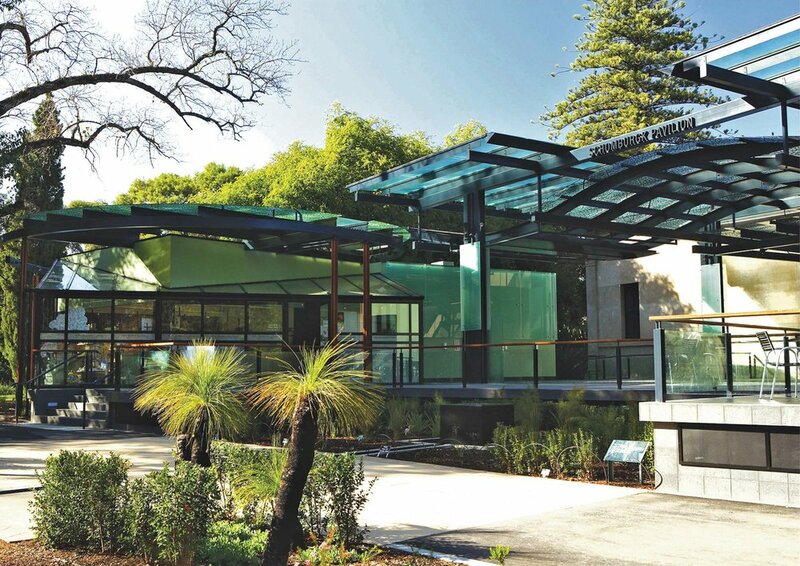 Located adjacent to the 1880’s State-heritage listed Museum of Economic Botany in the centre of the Gardens, the Schomburgk Pavilion consists of steel canopies clad with patterned glass hovering over a stone paved Terrace. A Visitors Information point, a shop, café and public toilets are located on two sides of the Terrace framing the central space, with the Museum and the Mediterranean Gardens on the other two sides. This central covered area is used for educational events, exhibitions and functions. The terrace, at the same floor level as the Museum provides easy access and doubles its functional size, with minimal impact on its heritage qualities. Beneath the terrace is a basement containing service equipment and rainwater tanks that capture all rain from the Museum and Pavilion roofs. As well as rejuvenating the Museum, it has become more significant within the Gardens with a complete new front, which is appropriate because of its history and its associations. The Schomburgk Pavilion is sympathetic and complementary to the Museum and has its own contemporary character and presence. The Pavilion also responds to the adjacent Amazon Waterlily Pavilion also by Flightpath Architects. The two buildings celebrate both the past and the future of the Gardens, and also make a positive statement about present-day society. The Schomburgk Pavilion nestles well into its site, and reflects, literally and metaphorically, the history of the Gardens and its exciting future. It was constructed on time and budget, providing a sensitive and subtle focal point.